Apparently the controversy about what to name America’s highest mountain did not begin with President Obama’s trip to Alaska in August. The way journalists presented it, the president showed up in the state and renamed Mount McKinley! I’m thinking, where did he get the ability to do that? 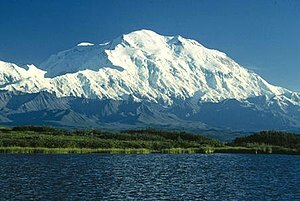 Mount McKinley, now named Denali. Well of course, he doesn’t have the ability to do that. Both Alaska state and the federal government have boards that name things like high mountains. These two boards, and many other people, have not agreed on a name for McKinley since 1975. Most presidents, if they wanted to get involved with dispute like this one, would move behind the scenes to resolve it. Not President Obama. People criticize him over and over for assuming power he does not have. They tell him, “You have to stop doing that, or people will call you King Obama, and draw Hitler moustaches on your pictures.” What public relations department would want to invite that comparison? Chiding the president is a national pastime, but acting like a dictator is not a joke. Nevertheless, Barack Obama seems to think his office is a joke. He proclaims, “I have a phone and I have a pen,” which means, “I do what I want, whenever I want.” It makes you think of the youngster in The Lion King, who looks forward to all the things he can do when he gets to be king. Someone ought to remind the president he is not a cartoon character. Instead of moving the parties along toward resolution in the McKinley naming dispute, the president wants to take credit himself. Nothing seems to lie beyond the power of his pen. He does everything except his job. Why do we have a president who goes around the country naming mountains? Why do we have a president who names even one mountain? He seems proud of his ability to do whatever he wants, and moreover to take credit for it. We have had two presidents in a row now, each callow in his own way. Bush lacked judgment; Obama lacks humility. They both do not see a connection between their shortcomings and the weakness of their leadership. When you make mistake after mistake, many of them consequential errors only a fool would commit, you should not get up one morning and say, “I think I’ll rename a mountain today.” It makes you look like a preener and a despot.